"Congrats on a wonderful site." This article, which appeared in the June 2002 edition of Hearth & Home Magazine, was commissioned by the Technical Committee of the Hearth, Patio and Barbecue Association. It represents a consensus of the major factory-built fireplace manufacturers. Fig 1. The fireplace in this house would not operate reliably because it has many of the features that lead to problems. The ideal wood-burning fireplace is a pleasure to use. It doesn't smoke when lit or spill cold air and odors when not in use; it doesn't back draft when the kitchen fan is on, and it works well regardless of wind speed or direction. For obvious reasons, everyone involved in putting fireplaces into houses, including manufacturers, architects, builders and installation contractors, want every fireplace to give pleasure and never frustrate the home owner. But sometimes fireplaces don't work well and the results are costly, not only in lost time but in the reputation of everyone concerned. Over the years the fireplace industry has spent a lot of time and money investigating problems and working to improve fireplace performance. We now know how to prevent problems through effective installation design. This paper provides a concise overview of the characteristics of good design. But before getting to he details of best practices for integrating fireplaces into today's houses, there is one essential fact you need to know. The most common fireplace problems are difficult and expensive to correct after the fireplace is installed, so the installation design stage is critical to success. Fig. 2 This system will function reliably becuase it has the characteristics that promote successful venting. Although installations that meet all of these best practices are ideal and are most likely to give trouble-free performance, sometimes house designs or client objectives make compromises necessary. Where one aspect of best practice cannot be met, fireplace performance might not suffer noticeably. However, installations with several characteristics known to cause problems are much more likely to create user dissatisfaction because of smoking and backdrafting. Therefore, while complying with all the best practices is a good target to aim for in all installation, some compromise will not necessarily result in poor performance. These best practices can be expected to produce good performance in most fireplaces. However, the installation instructions provided by the fireplace manufacturer take precedence, so they should be followed if they differ from the recommendations made here. Venting failure is usually caused by the location of the fireplace and its chimney in the house and the way other equipment affects fireplace operation. For this reason the best time to prevent smoke spillage from fireplaces is during the planning stage as the fireplace system is integrated with the house design. Following, and in Figures 1 and 2, is a summary of the elements of best practice that are discussed in this paper. 1. Install fireplaces and chimneys inside the building. 2. Penetrate the building envelope at or near its highest level. 3. Avoid large, uncompensated exhausts. 4. Avoid very short chimney systems. 5. Use straight chimney systems. 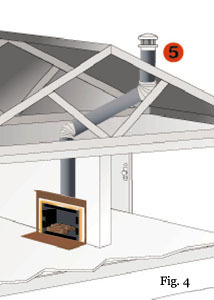 A common installation practice involves locating the fireplace and its chimney in a chase projecting outside the building envelope to conserve interior floor space. Despite is popularity, the practice of locating fireplaces in outside chases is one of the main causes of complaints about fireplaces that spill odors and cold air when not in use and smoke when a fire is lit. A fireplace depends on the buoyancy of its hot exhaust to draw in combustion air and create flow up the chimney. But when the chimney runs up the outside of the house, its ability to resist the negative pressure in the house due to stack effect is weakened (see discussion of stack effect below). Draft which is the pressure difference needed to vent fireplaces successfully, is influenced by the temperature of the exhaust and the height of the chimney. That is, the hotter the exhaust gases, the stronger the draft. And the taller the chimney (at a given temperature), the stronger the draft. In well-designed systems there tends to be a low level of draft present during the heating season even when the fireplace is not in use. This "standby draft" is produced because the room temperature air in the chimney is warmer than the outdoor air, so it rises. Without standby draft, chimney flow can reverse, spilling foul odors and cold air from an unused fireplace. Under standby conditions the air in a fireplace and chimney installed in an outside chase tends to cool gradually to below room temperature, even if the chase is sealed and insulated. as the chimney temperature falls, draft declines along with it. The loss of standby draft is worsened by the fact that negative pressure inside the house can work against upward flow in the chimney. The three most common causes of negative pressure in houses are stack effect, exhaust fan effects and air circulation system imbalances. One or more of these sources are found in all houses to varying degrees. Just as warm air in a chimney produces draft, the air in the house is warm relative to the outdoor air so it tends to rise, producing a pressure difference called stack effect. 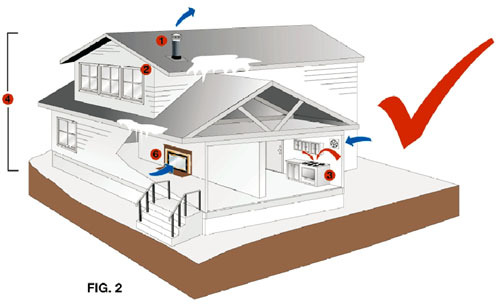 Stack effect creates negative pressure in lower levels of the house, where fireplaces are normally installed. the negative pressure due to stack effect is enough to force a cold backdraft in a fireplace chimney that is cooler than room temperature. If one attempts to light a fire in a backdrafting fireplace, smoke will flow into the room instead of up the chimney. 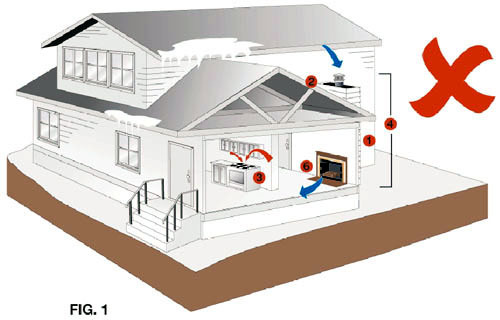 The negative pressure due to stack effect experienced by the fireplace is strengthened if the house had excessive leakage at high levels (see below). The cure for this form of venting failure is straightforward: Install chimneys through the warm space enclosed by the building envelope. A chimney installed inside the house will produce more standby draft than the house produces in stack effect. This is because the air inside the chimney is at room temperature, but the chimney is taller than the warm space of the house. 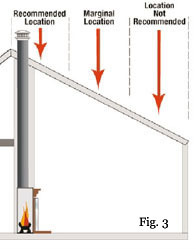 The negative pressure due to the stack effect in the house is never strong enough to overcome standby draft in an interior chimney (subject to the effect discussed below). Keeping a chimney at room temperature during standby conditions deals with one of the main influences on chimney draft. The other factor is height and it is just as important. To produce enough standby draft, a chimney must not only be as warm as the house, but it must also be as tall as the highest part of the building envelope in order to overcome the negative pressure due to stack effect. The problems resulting from a chimney being installed in an outside chase or penetrating the building envelope at or below its top are made far worse if the majority of leaks in the building envelope are concentrate at high levels. High level leakage can be created by recessed light fixtures, ceiling fan mounts, poorly fitted attic hatches, fold-up stairs and skylights. High level leakage sites should be minimized if possible and, where unavoidable, they should be carefully sealed to the building air barrier. To avoid these problems, a chimney should penetrate the highest part of the building envelope. For most common house designs, this means that the fireplace and chimney should be located on an interior wall rather than a perimeter wall. Fireplaces and chimneys that are located on perimeter walls (or outside perimeter walls in chases) are more vulnerable to the adverse effects of wind because their chimneys tend to be low relative to roof lines. The general strategy for preventing cold backdrafts under standby conditions is to locate fireplaces and their chimneys centrally in buildings rather than against perimeter walls. The same approach is effective in reducing the potentially adverse effects of wind by placing the top of the chimney above areas of wind turbulence. Even in cases where venting problems are assumed to be wind-related, the replacement of the standard chimney cap with on of specialized design should only be done with the approval of the fireplace manufacturer. The standard chimney caps supplied by manufactures of factory-built fireplaces and chimneys are usually of good design, so replacing standard caps supplied with these fireplaces is not necessary. In fact, the supplied cap should never be replaced or left off for aesthetic or other reasons because the result could be venting failure due to adverse winds. Decorative shrouds for chimney tops should never be used unless listed by the fireplace manufacturer. When a large exhaust, such as a down-draft kitchen barbecue fan, is turned on in a modern tightly constructed house the pressure inside can drop below atmospheric pressure outside. This negative pressure competes with upward flow in a chimney produced by draft and can result in spillage of smoke into the house. Once they are aware of it, most homeowners can manage this potential problem, but it can be alarming when first experienced. One way to prevent this is to avoid the use of large exhaust fans in houses with wood burning equipment. Another way is to compensate for the volume of air exhausted with a roughly equal amount of make-up air brought in from outdoors. A make-up air fan can be electrically interlocked with the exhaust fan switch so that house depressurization is prevented. Make-up air systems of this type can function without the homeowner having to take action or even being aware that it is operating. Pressure imbalances in houses can also be created by design problems with forced-air heating and cooling systems. Leaking ducts and air handler located outside the building envelope in attics or crawl spaces are common causes of negative pressure problems. Unbalanced supply and return airflows can also depressurize the space where a fireplace is located, leading to spillage of smoke and cold air. A ducted supply of combustion air from outdoors has been promoted - and even made mandatory in some building codes - as a solution to smoke spillage problems with fireplaces. Although there is anecdotal evidence of effectiveness in some situations, the available research shows that outdoor air supplies do not reliably prevent smoke spillage. Where required by regulation, these outdoor air supplies must be installed, but they should not be relied upon as a primary measure to ensure good fireplace performance. At a given temperature difference, a taller chimney will produce more draft than a shorter chimney. While factory-built fireplaces are normally approved for minimum system heights in the 14 to 15-foot range, taller systems than this are preferable for good performance particularly for fireplaces with generous heath openings relative to chimney diameter. The larger the fireplace opening, the more air must pass through it to prevent spillage. For fireplaces with large openings or with more than one open side, such as see-through or corner fireplaces, a system height of at least 20 feet is preferable. Note that the installation instructions for listed factory-built fireplaces provide chimney height limitations and these should be followed precisely. Chimney offsets should be avoided where possible. Each elbow or offset in venting system creates turbulence in the flue gas steam and therefore presents resistance to flow. Offsets in chimneys are not uncommon but their use demands special attention to the other aspects of system design. Manufacturer’s instructions for factory-built fireplaces should be reviewed carefully for criteria associated with the use of offsets. Open fireplaces are particularly vulnerable to smoke spillage for two reasons. First, the main restriction to flow - the chimney - is downstream of the fire, and there is little resistance to spillage flow into the room. Second, most new homes do not provide enough natural leakage to supply the large amount of air that an open fireplace consumes. Spillage resistance is increased significantly if the main flow restriction is on the room side of the fire in the form of glass doors, which also reduce the amount of air that he fireplace needs for satisfactory operation. Many homeowners enjoy the crackle of an open fire and some fireplaces in some houses can operate successfully this way. But changing conditions, like adverse winds, the operation of an exhaust fan, unbalanced airflows from one room to another, or even people walking in front of the fireplace, can induce spillage from the open heath. See-through or multi-sided open fireplaces are particularly vulnerable to these pressure differences and airflows. If smoke spillage occurs, the quickest and most effective way to stop the spillage is to close the glass doors. Glass doors can also help to reduce air leakage up the chimney and hearth odors from spilling into the room when the fireplace is not in use. For these reasons all fireplaces should be provided with glass doors, even if the purchaser expects to use the fireplace as an open heath most of the time.